If adding flour to thicken, use ¼ c of cold water and add flour, stirring until dissolved. Add mixture to the soup and stir until thickened. Serve hot, in decorative soup bowls, garnish with a dollop of tofu "sour cream" & a sprinkling of parsley. Serve hot, in decorative soup bowls, garnished with a dollop of tofu “sour cream” and a sprinkling of fresh parsley. Kenden Alfond coined the archetype of "The Jewish Food Hero". Passionate about her Jewish culinary heritage, she takes traditional Jewish recipes and spins them into delicious whole plant based cuisine without oil. 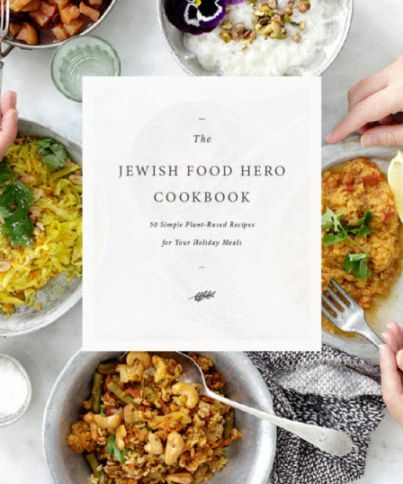 “The Jewish Food Hero calls out to the healthy hero within each of us. It helps us all to create a new and healthy food future, one that is connected to our most beautiful traditions...“ View all of Kenden’s projects and her gorgeous website at http://jewishfoodhero.com/about/. If you like this recipe, you will love the Jewish Food Hero Cookbook: 50 Plant Based Recipes for your Holiday Table. Click here to review the cookbook.